This article is about the Dwemer ruins. For the province, see Hammerfell. Volenfell ("City of the Hammer" in Dwemeris) was the capital of the Rourken clan of the Dwemer, located in eastern Alik'r Desert, southeast of the city of Satakalaam. Volenfell was founded by the Rourken clan, exiled from Resdayn because they refused to join the First Council and make peace with the Chimer. The legend holds that the Rourken chieftain threw his warhammer, Volendrung, towards the sky and said that his clan would settle wherever it fell. 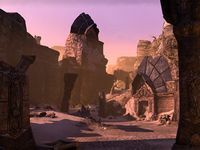 The Rourken subsequently left Resdayn, crossed Cyrodiil, and arrived in the southeastern Alik'r Desert, where they established the city of Volenfell as their capital. Later, the city gave its name to the entire province as well. The Rourken shared the fate of all Dwemer, disappearing mysteriously around 1E 700. The location of Volenfell was eventually lost, but the ruins of the city were rediscovered shortly before 2E 582, prompting a race between scholars and treasure-hunters to be the first to search its storied depths. In 2E 582, a Redguard treasure hunter Tharayya and her ex-husband Quintus Verres were working on competing studies of the Dwemer. When Tharayya discovered the lost ruins of Volenfell, Quintus poisoned her and stole her journals in order to get to the ruins first. Tharayya survived, gathered an army of mercenaries and followed Quintus; however, her group was ambushed by Quintus' own mercenaries in Volenfell. Soon afterwards, a group of Undaunted adventurers entered the ruins. Tharayya offered them a reward for helping her defeat Quintus, recover her research notes and find an ancient Dwemer artifact called Guardian's Eye. The adventurers defeated Quintus' army and recovered the notes, but they failed to get the Guardian's Eye, which disappeared when Tharayya tried to release it. The same year, the Empire of Cyrodiil and the Imperial Legion launched an invasion of Daggerfall Covenant lands, led by Magus-General Septima Tharn. The Second Cohort of the Seventh Legion was ordered to march on Volenfell in order to locate an "item of significance" to the Legion. This was likely the Guardian's Eye, although the orders were replaced with forgeries before the Cohort had even reached the Alik'r.